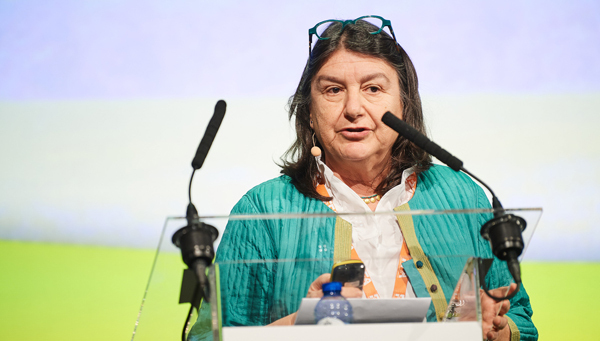 Hilal Elver, Special Rapporteur on Right to Food, United Nations, pointed out that hunger, famine and malnutrition are on the increase during her keynote address at FFA2018. She explained that in 2017, 815 million people faced food insecurity – an 11% increase since 2015. Some two billion suffer from undernutrition and micronutrient deficiency. Four countries – North East Nigeria, South Sudan, Somalia and Yemen – are in danger of famine. Conflict, climate change, extreme weather and economic slowdown are all causes. Dr Elver added others: the failure of poverty elimination and rural development policies, homelessness, a charity mentality and “hunger and malnutrition as a by-product of neo-liberal global capitalism”. This is occurring as global production of wheat, rice and coarse grains are at historically high levels. “We have more than enough food for our needs,” she stressed. The 17 Sustainable Development Goals (SDGs) include aims to end hunger, achieve food security, improve nutrition and promote sustainable agriculture. However, their targets, according to Dr Elver, are “too ambitious”. She offered her own solutions. The first is to move from charity to a human rights approach to food security. This should be accompanied by changes in production methods and an emphasis on demand and needs, not supply, while implementing agroecology as an alternative to industrial agriculture. Consumption patterns must change to reduce meat intake and food waste and promote local and seasonal produce. Food systems should become more democratic and community supported agriculture encouraged. Global land tenure reform is needed to give farmers in developing countries property rights they now lack. Cyriaque Sendashonga, Global Director, International Union for Conservation of Nature Policy and Programme Group, emphasised how agriculture and nature are close allies. One cannot survive without the other. She insisted on the importance of the Sustainable Development Goals. They have “the beauty of being a universal agenda” and provide a framework for the connections between agriculture, health, the environment and jobs. She reminded the EU of the major impact its agricultural and commercial policies have on the global food system. “It has a unique responsibility and opportunity to really get its agricultural agenda right,” she said.